Regina Peterson views a White Walls Boston art installation in a U-Haul truck. A 26-foot U-Haul carrying what looked like a sparkling black hole made passersby stop to look in wonder last weekend. The truck was part of a traveling art exhibit called White Walls Boston that visited both predetermined and random locations in Cambridge, Allston, and Jamaica Plain on June 30. It was the first in a three-part series this summer that will showcase projects by local artists. Ethan Kiermaier, 33, who lives in Jamaica Plain, decided to start the mobile art series after seeing artists struggle to find space to display their work in Boston. 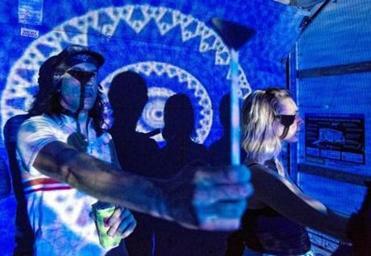 White Walls Boston, supported by a Berwick Research Institute grant, provides a “flexible platform for people to get their ideas out there,” said Kiermaier, who graduated from Massachusetts College of Art and Design in 2002. Andrew Leonard of Jamaica Plain looking the the White Walls Boston installation. Instead of giving street addresses for the scheduled White Walls stops, he posted the locations’ longitudes and latitudes online the day before. “Part of [the allure] is not letting people in on the where and when until practically the last minute,” he said. White Walls Boston isn’t the first art show on wheels. In the early 2000s, a group of artists from Jamaica Plain called the Esprit de Corps Art Collective used a truck to display art around Boston. Groups in other cities, such as Art Cart NYC, also work with artists and performers to create public art in and around the space of a truck. Jesse Kaminsky was the first artist featured in the White Walls Boston series. 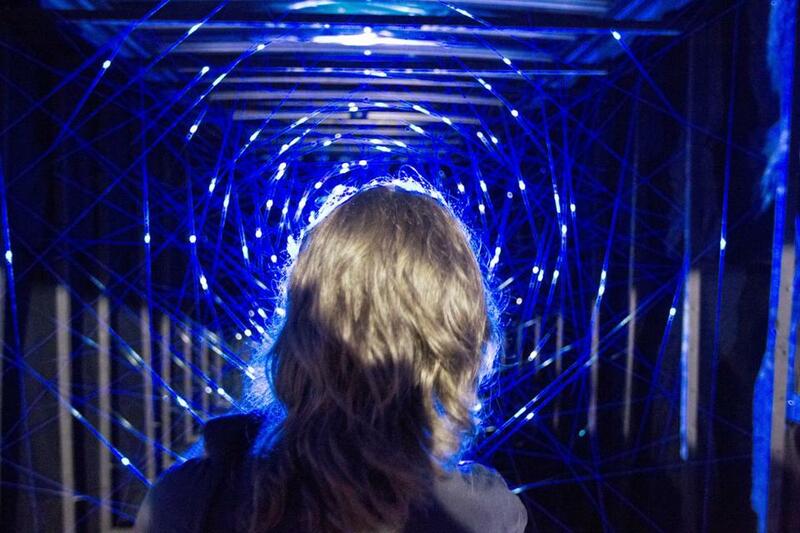 Kaminsky, who is a neighbor of Kiermaier, worked with performance artist Vela Phelan to create an interactive video installation called “Phototrop.” Inside the truck, a projector reflected on a web of dark blue fishing line to make circles that moved as observers swayed from side to side. Viewers were each given a stick with a black triangle on the end and told to hold it up to the lights beaming toward them as they walked up the ramp and into the truck. The triangles ensured the light didn’t blind them as they stared at the reflection from the projector. 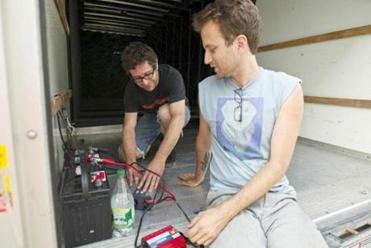 Artist Jesse Kaminsky (left) and White Walls founder Ethan Kermaier at work in the truck. After renting the U-Haul at 9 a.m on exhibition day, the artists went to work building the piece. The display was working well — ­until they pulled up to their first stop in an empty lot in Cambridge near Massachusetts Institute of Technology. Kaminsky turned on the power inverter, which spurted out smoke and an acrid smell, but no electricity. With a half-hour before the 8 p.m. show was to begin, Phelan took off in search of a Best Buy. Kiermaier and Kaminsky sat in the back of the truck, and remained remarkably calm considering the show depended on electricity they didn’t have at the moment. As they waited, visitors who had heard about the truck exhibit — a few of Phelan’s friends, some women riding bikes, and an art historian with her family — came to check it out. They left, promising to catch it at a later stop. The exhibit had more success in Central Square, where the artists got the display to work, and the spectacle attracted about 20 visitors. Liz Munsell, a curatorial research associate for the Museum of Fine Arts, curated a show for Phelan last summer and is familiar with Kaminsky’s work. She came to the second stop because she was intrigued by their collaboration. Their styles are different, but they meshed well together, she said. “Jesse’s contribution of the sculptural screen fused really well with Vela’s contribution of the visuals and the aura of the sparking light,” Munsell said. The truck made an unannounced stop at the bar River Gods in Cambridge, then headed to a Stop & Shop parking lot in Allston after 11 p.m. The parking lot remained otherwise desolate, so Kaminsky turned the engine on, and trio of artists decided to try their luck at another unplanned location. They settled on the Allston Food & Spirits parking lot on Cambridge and North Harvard streets. Steve Dyer, 25, was on his way to a nearby concert when he and his friends spotted the blue light blaring from the U-Haul. Kaminsky handed them the observation sticks and told them to have a look. At 12:30 a.m., the artists loaded the ramp and pulled the door shut once again. It was time to head to the last stop, outside the Jamaica Plain performance space Spectacle. About 30 people gathered in the parking lot to see the work, eat Chinese food, and drink beer before the artists dismantled the installation and prepared the truck for return to the rental company laterin the morning. Kiermaier’s idea to start an art truck isn’t novel, but it helps make art more accessible to a broader audience, said Munsell, the curator. The show will focus on glossolalia, or speaking in tongues, and give a platform for the free-form expression of artists, activists, and citizens. Sept. 1: Musician Shane Butler, details to be announced. Stephanie Steinberg can be reached at stephanie.steinberg@globe.com. Follow her on Twitter @steph_steinberg.